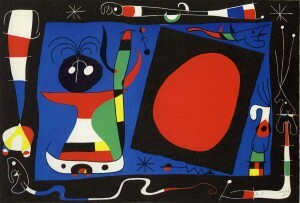 Joan Miro was born April 20, 1893 in Barcelona to Michel Miro Adzerias a goldsmith, and Dolores Ferra, the daughter of a cabinetmaker. 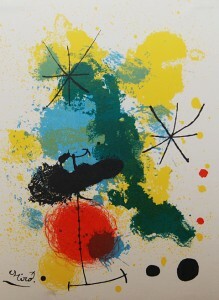 At an early age, Miro attended drawing lessons in the evenings after school. At 14 years old, after a brief period of time at a school of commerce in Barcelona he entered the La Lonja Academy of Fine Arts where he came under the influence of two teachers: Modesto Urgelle and Jose Pasco. He continued his studies with Pasco while working as a clerk in a business house until a serious illness caused him a leave of absence. 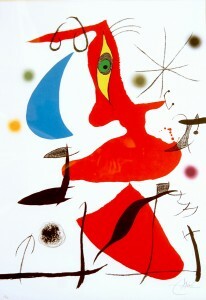 Then in 1912 he entered the art school of Francisco Gali in Barcelona. During his years at the school he became interested and influenced by contemporary painting, Impressionism, Fauvism, and Cubism. He attended drawing sessions of the Sant Lluch Circle, where the architect Gaudi had been a student. In 1916 he visited an exhibition of French art organized by Vollard in Barcelona. 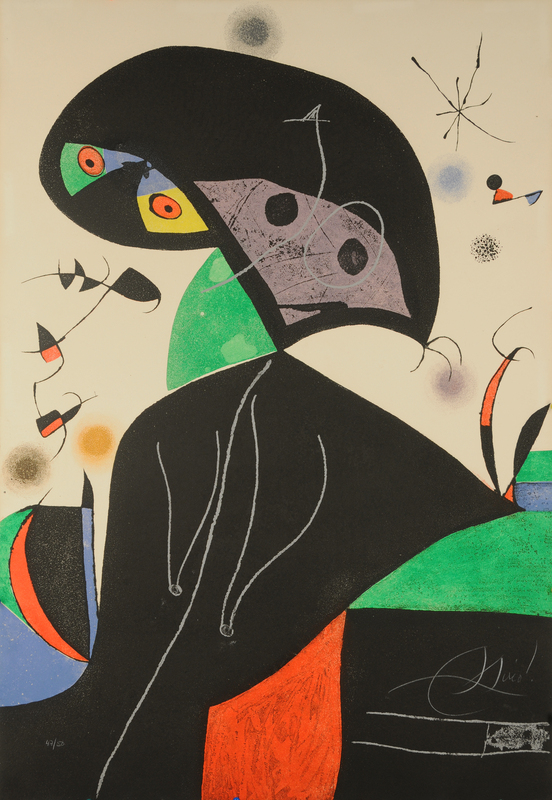 During this time Miro met many influential figures of the art world, such as F. Picabia, the founder of the Dada review “391,” Marie Laurencin, and Max Jacob. He had his first exhibition in 1918 at the Gallery Dalmau, and in the same year became a member of the Agrupacio Courbet, a group of young painters around Artigas. He painted “detailist” landscapes at this time. 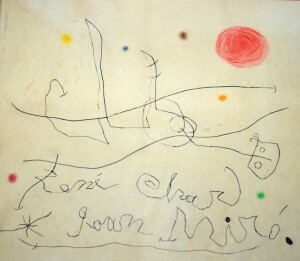 Then in 1919 Miro took his first visit to Paris, where he met and became friends with Picasso. He spent the subsequent winters in Paris, returning to Montroig with his family for the summer. At the end of 1920 he took a studio at 45 rue Blomet in Paris. His first Paris exhibition in 1921, organized by Dalmau at the Galerie La Licorne was a complete failure. 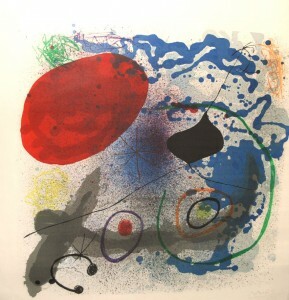 Until his next exhibition in 1923 Miro established a close relationship with the neighboring artists surrounding his studio in Paris; and with Henry Miller and Hemingway. 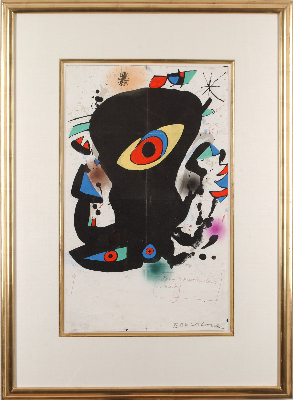 Then in 1924 he joined Andre Breton Louis Aragon, and Paul Eluard in the Surrealist group, and in 1925 took part in the Surrealist exhibition at Galerie Pierre. 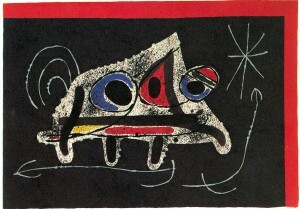 During the years that followed he lived next to and worked closely with Max, Ernst, Magritte, Eluard, and Arp, he was married in 1930 to Pilar Juncosa on October 12th, and continued exhibiting with the Surrealists from New York to London. After the outbreak of war in Spain in 1936 he left, not to return for four years. He had 22 works included in the International Surrealist exhibition in the same year, at the New Burlington Galleries in London. 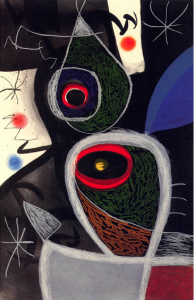 In 1940 while beginning his Constellations series finished the next year, Miro returned to Paris in the face of the advancing German army. He returned to Spain that same year. 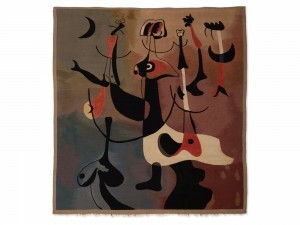 In 1942 Miro returned to live in Barcelona, he begins to work with ceramics in collaboration with Artigas. 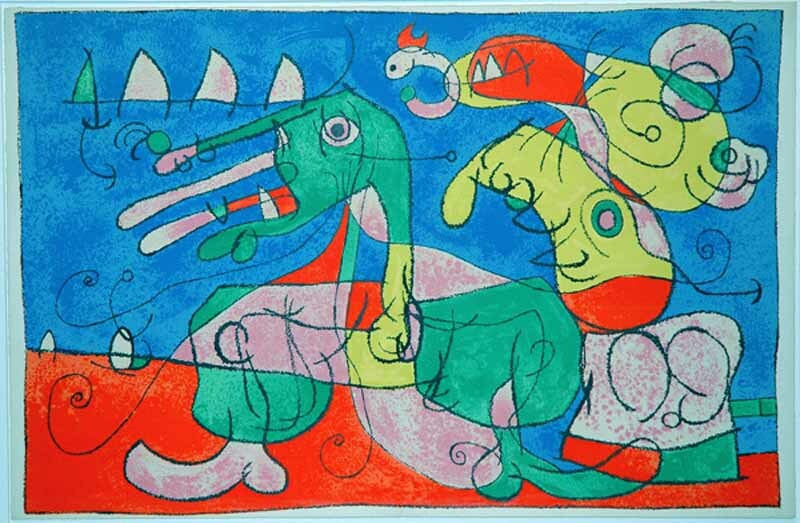 He makes his first visit to the United States in 1947, and returns to Paris the next year where he produced numerous engravings and lithographs.